WIW: enjoying the mild fall weather while I can! WIW: road testing my SSIF loot! WIW - back to the grind! WIW: (almost) Toffee, Tomato, White and Burgundy featuring SSIF find! It is the last week of October and no snow - yay! It has been a good autumn so far and leaves turned beautiful colors so I am trying to enjoy it while I can. This outfits are mostly from items from the last year or earlier with a couple of new(er) things thrown into a mix. Except of #1 every other outfit was worn to work. The plaid Kut jeans are from this year NAS, the rest is older: Danier leather jacket, Banana Republic turtleneck, Sam Eldeman Petty booties. The belt is golden sparkle from Winners. Everything is more than a year old here. My mom altered these Express flare trousers so I can wear them again. Somehow I have hard time what to pair them with, maybe I need to do a trial run? Here I have tried to keep the trousers, belt and booties in similar tones for a softer effect. Mini-stripe shirt and cream jacket also add to the soft look. 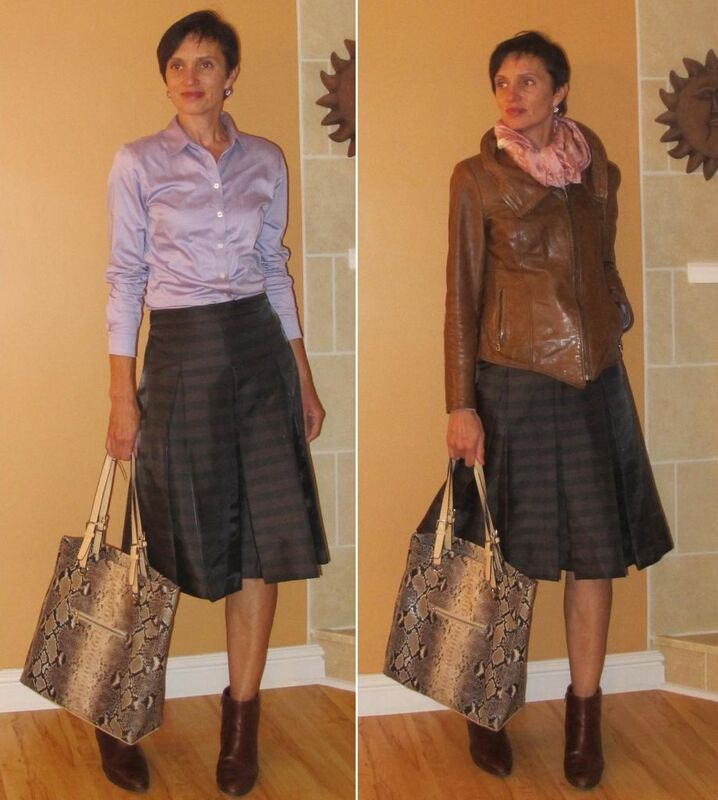 Brooks Brothers mini purple stripe shirt, Danier leather moto jacket, Sam Eldeman Petty booties, Danier silver tote, cheap snakeskin - like belt. #3 Culottes - you cannot stop with just one! Again - everything is at least a year old here. These grey culottes were wide leg sailor pants in their earlier life (see pic 6). I am enjoying my cream culottes so much that I decided to make another pair out of those wide legs. I hope this worked out - I enjoyed wearing them that day. I decided that I will get much more wear out of culottes than out of wide legs because footwear heel height and weather restrictions are not applied anymore! Like midi skirts midi-length culottes are most flattering with heels - I rebelled here and wore them with leopard loafers. I decided that the cool vibe of the shoes should compensate for the unflattering factor. Danier satchel, Banana Republic turtleneck, Danier leather blazer, Vince Camuto loafers. I like the color of this burgundy dress and its pleated midi skirt. It also has sleeves! However I have hard time wearing it on its own because of the deeper v-neck neckline (I was not that style-savvy 3 years ago when I got it): it does not do anything to my small and bony chest. To fix that I layered a navy sweater over it for a relaxed look. I toyed with scarves and necklaces for a bit because the sweater felt too plain here but in the end decided to go with statement booties instead. 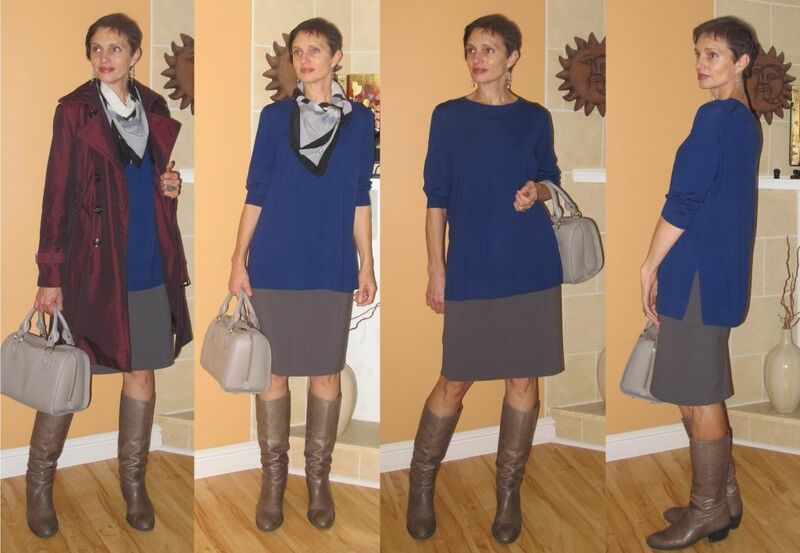 Donna Morgan dress, JCrew Tippi sweater, Danier tote, David Tate booties. So how did I do for my first EVER plaid shirt outfit? I decided to pair it with cream jeans and white studded belt to echo the white in the shirt and with burgundy booties to echo the red in the shirt. Rolled jeans for BF effect and added a dressy tux jacket for juxtaposition. 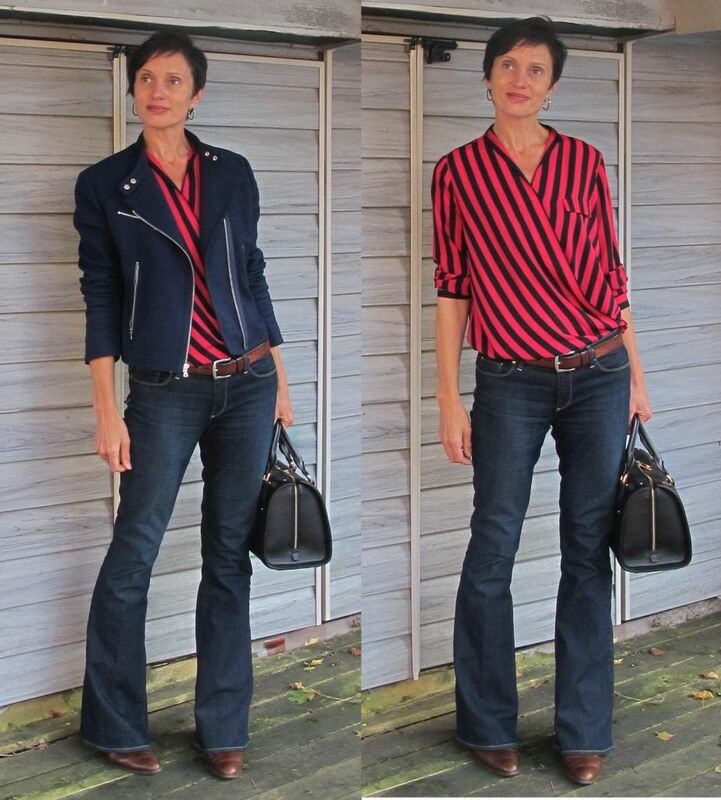 Hopefully it was not a failure...because I liked it :-) I wore the collar open during the day but here is a picture with it buttoned up to the top - what is your preference here? LLBean plaid shirt, Banana Republic tux blazer, Banana Republic cream skinny jeans (VERY relaxed), Danier tote, Naya burgundy booties...other than the shirt everything is at least a year old or older. As usual all comments and suggestions are very much appreciated - thanks for looking! Happy Halloween! This outfit was inspired by Angie's post on trends for the spring 2015 and in particular on blue and orange being The Colors. Here is my orange silk shirt from Costco paired with Madewell straight leg jeans and Gap navy moto. #2 Culottes are out again! This time I have styled my new cream culottes very differently from their first outfit last week. Instead of heeled almond toe booties and tucked in shirt I went with a boxy turtleneck and tall cognac wedge boots.What do you think of this one? JFE to pass YLF filter? I am usually off necklaces right now but for some reason I wanted to wear my amber tie-like necklace here to lighten the ink sweater and tie in with the boot color. Here is also a picture of this outfit without the necklace - which do you like better? I LOVE this gilet! Every time I put it on I feel a burst of self-confidence and I think I even walk differently in it - strutting most likely! ;-) Last time I wore it with BF jeans and t-neck in a more casual outfit - this time with a white BB shirt and Paige denim flares. I wore the shirt untucked like in pic 3but for a picture tried with the shirt tucked in (#4). Do you have any preference for a shirt worn tucked or untucked here? Today was "Wear Red" day in memory of Canadian soldiers recently killed in Ottawa and Quebec. Such a tragic and senseless loss! This outfit was along the lines of Angie's today ensemble but with a statement tunic instead of a statement sweater. I had a hard time wearing these grey skinny Martin pants with Ugg Chelsea booties. I wore the pants untucked and full length but because they are on the short side they kept getting caught on the top of the booties when I was sitting. I tried to roll them above the booties but it felt too "busy" somehow - and I definitely don't feel them tucked in (all examples are in the picture). What do you think? How would you wear them? Thank you for looking and usual all comments and suggestions are very much appreciated. Today's outfit is featuring 2 items which were altered from their original state. I was searching for new black cigarette trousers after I shrank out of my trusty old skinny Martins. Well fitting cigarette trousers are hard to find especially if you have curves: they have to fit precisely - not too snug, not too loose...tall order! So when I tried on those Express bootcut Columnist pants in Seattle and got Angie approval on the fit I knew what I want to do - buy them and get my Super Mom taper the legs. Here is the result and I am pretty happy with it! I call it sleeveless jacket because this is true: it was a Trouve cropped jacket from 2011 NAS (see pic 5) It was becoming an orphan and it surprises me because I loved the style. And then recently a lightbulb went on in my head: it is all in the sleeves! The wool fabric of the jacket is pretty thick so it may be too hot to wear indoors but because the sleeves are cropped it is not good for outdoors as well. 3/4 sleeves were pretty narrow and hard to layer under...comfort was not there! I was considering to donate it but then had an idea: maybe I should try to remove the sleeves and make a gilet out of it? It would make it less hot and will be easier to layer over long sleeve sweaters and shirts. So now it is brought to your honest review: what do you think - frumpy or stylish? Should I keep it or toss it? I envision pairing it with my AT white tunic...other suggestions? Even though this sweater is not cropped I think it works with the skirt here because it is fine knit which is swingy on the bottom and it makes 2:1 proportion to the skirt length (or so I tell myself). I felt a need to add something but did not like the necklace here so went for a grey silky scarf for a tonal look. Is it better with or without the scarf? - dove satchel - this is my essential bag when I want to lighten things up. Another try for that lilac BR shirt here. I think I am ready to pass it on: it is too bunchy tucked in (looks like the fabric is not drapey enough) and too short to wear under a sweater like here. Too bad as I like the color! Debut of my SSIF shadow plaid trousers from AT. This is regular length as long was not available. I had the hems tapered though so they work at this length for me - and easier to wear in bad weather. After wearing them that day I decided to let an extra 1" out for more scrunch so they are back to my mom now. You cannot see from this picture but booties match the red in the plaid. Essentials: navy sweater, dove bag. pic 3 Cream and brown or Culottes are out to play! I had them shortened by 2" as I think they look better on this length. wildcard which is going to come out quite often as it is another love. Bonus: it fits completely under my trenches and black coat - yay! Question: I tried to roll BF jeans 2 different ways here -smaller roll with longer length and higher roll. Because of the bootie opening the roll has to be clear of it or otherwise it get caught in it. Which roll is better? Do you think I got my essentials right here? As usual all comments and feedback are very much appreciated. This was my poor attempt to copy Denise who copied Greg's outfit. The new item from Seattle is these UGG Chelsea booties - -at last I have black booties to play with! pic 3 I forgot how to style skinnies! These are Madewell skinnies Angie made me buy in Seattle. I think they fit me well and the length is passable but I am afraid I forgot how to style skinny jeans after wearing slouchy styles for the last 2 years! Or maybe my eye needs re-adjustment back from the looser styles? This outfit did not feel 100% right to me - was it outfit itself or just my reluctant eye? I think I liked this outfit the best from this week. It features a new striped shirt from Ann Taylor. It drapes very nicely and layers well even under this thin Tippi merino sweater. I went all out and added my plaid Kut jeans, cream oxfords and tan leather trench. Was it too over the top? Anyway it was fun! Do rolled jeans look seasonally confused with the trench? This was another outfit I was not sure about. It ended up to be "volume on volume" one. I wanted to wear my new oversized shirt from Ann Taylor and decided to wear Paige bootcuts using one of the last dry fall days. Alas - these bootcuts are very "relaxed" on me now and not fitted in upper legs anymore so I am afraid they looked too frumpy with the f oversized shirt. I felt better with the jacket on because it was adding structure and reining in some shirt volume. What do you think - fashionably oversized "volume on volume" or bordering on a frumpy side? This was my week - thanks for looking! As usual all comments and suggestions are very much appreciated. I have already posted one of the outfits from this week with the dress bought in Seattle. Here are the remaining two. I have included a rear view for both tucked in untucked version. Before my firm preference was untucked back but now with my new size I am experimenting with the full tuck as well. Which version do you prefer? (Inge, I think the bright pink of this blouse is in the same color family as the raspberry pink of the dress I tried on at Macy's - no?). It looks like today was the last day of the warm weather and it will be all downhill from there. I decided to give a last whirl to my summer clothes before I pack them away for the winter. These are my "best fitting" slouchy pants from this summer. After bringing back a whole load of pants for a "new me" it was weird to don these very loose pants again. I still like the fit of baggier trousers but want them fitting better on top - just fluid and tapered in the legs. Thank you for looking and as usual all comments and suggestions are very much appreciated. in it. It is past my knees! It has long sleeves! It has a high neckline! And it also has pattern I feel comfortable in because it is subtle and low contrast. When I bought it I thought the dress is dark brown but now I think it is black. My only tomato red item is my Chromia satchel so it came out to play today. For a topper I selected my Danier white moto - and off I went to work! Dress does make it easy to dress. I kept moto on outside as the morning was chilly and then indoors it was on and off depending how bad AC was at the moment. It was such a relief to be able to wear this dress sans any topper because IT GOT SLEEVES!!!! I felt so good in it all day. The quality is quite nice and the fit is spot on (as you would expect with Angie fitting you in it). It does feel a bit close in the armholes but the fabric is stretchy so I hope I can get used to it. I am going to wear it with tall dressy boots and pumps and with myother booties. For toppers I think my navy Gap moto, brown Danier leather blazer and even black long tux - and maybe even my new charcoal gillet!